You can add a feature to your Google Calendar that displays a countdown timer for your next meeting. The countdown timer—called "Next Meeting"—is a straightforward calendar feature that displays the days, hours, and minutes remaining before the start of your next scheduled event in an easy-to-see widget on the right side of the calendar page. The Next Meeting feature is available for testing by users in Google Calendar Labs, and it is simple to enable and use. If you're not familiar with it, Google Labs is a page that offers features and add-ons for many of its applications, such as Google Calendar and Gmail. These features have not been fully tested and have not been rolled out to the standard Google Calendar for everyone, but users can activate them to try them out through Google Labs. Click on the Settings button (it has a cog icon on it) in the upper right of the page. Along the top of the Settings page, click the Labs link. The Labs page will offer numerous features that expand the functionality of Google Calendar in all sorts of ways. Be aware, however, that these are "not ready for prime time," as the page cautions. Generally, they may not work as smoothly for every computer and platform out there in the way a fully tested, implemented, and released feature or product from Google would; however, they are pretty well tested before they arrive at the Labs page and should not pose a risk to your calendar or data. 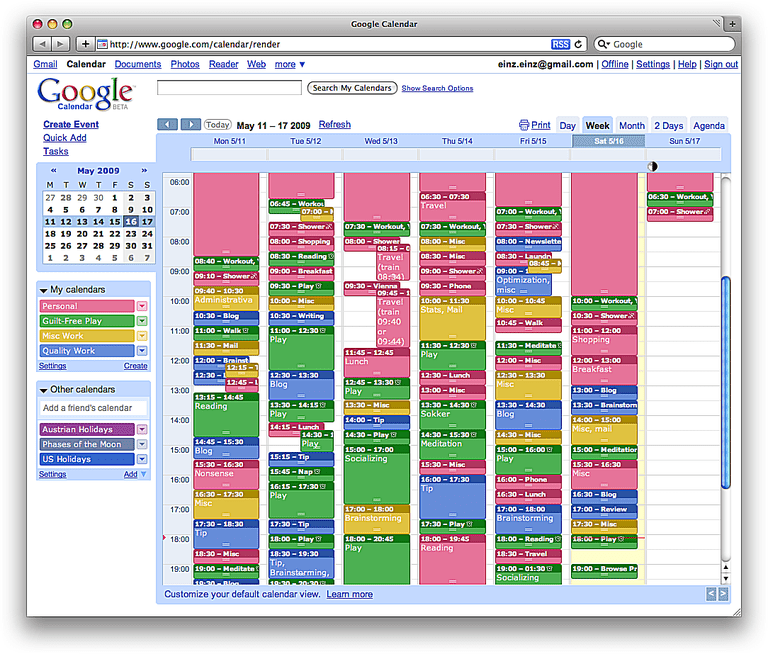 Google is always improving its calendar, and in some cases, the company may be transitioning to a new user interface. Users generally have the option to upgrade and try new versions and layouts of Google Calendar, while keeping the option of reverting to an older version if they choose. If you cannot find the Labs link after going into your calendar settings, you may have an upgraded version of Google Calendar in which Google Labs is not accessible. You may be able to revert to the "classic" version of your calendar, however, and still access Labs. To check, click the Settings button in the upper right, and then click the Back to classic Calendar option if it is available. On the Labs page, scroll down to find the Next Meeting feature. Click the radio button next to Enable. Click the Save button located at the bottom or at the top of the list of add-ons. You will be returned to your calendar view, and the countdown to your next meeting or event will appear to the right of your calendar as a widget in the task pane. If the task pane is not visible on your calendar, open it by clicking the small left-pointing arrow button located about halfway down the right edge of your calendar. The task pane will slide open to display your next meeting countdown. If you find you no longer want to use the next meeting countdown feature, you can remove it from your calendar as easily as you added it. Follow the instructions above to go to the Google Calendar Labs page. Scroll down to the Next Meeting feature. Click the radio button beside Disable. Click the Save button at the bottom or top of the screen. Your calendar will reload and the countdown feature will no longer be displayed. Because features offered in Google Labs are still being tested, as a user your feedback on them is valuable to improving them and deciding whether they are adopted as standard features in the application. If you've used the Next Meeting countdown feature or any other feature and you liked it—or you disliked it—or you have suggestions for making the feature better, let Google know by going to the Labs page and clicking on the Give feedback and make suggestions about Calendar Labs above the list of features. How Do You Connect Google Docs Files With Google Calendar Events?